I was approached by Greg Buchel of Big Horn Armory and asked if I would produce this cartridge for Greg’s upcoming new series of AR 10 carbines. 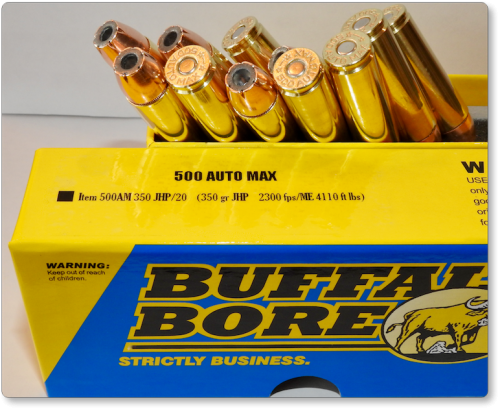 At the time of this writing, (03-18) the 500 Auto Max is the most powerful cartridge made for use from any AR platform. This cartridge is simply a 500 S&W casing with a slightly smaller rim. 500 S&W load data can be used to make this cartridge, but care must be given to powder selection to keep from gumming up the AR action. I’ve thoroughly enjoyed testing and developing loads for this cartridge. I admit to being a generation behind on what is stylish in any industry………..In my generation, if we went fishing on a salmon choked, bear-infested stream in AK, we carried a powerful lever action (normally chambered in 45-70) rifle, pump shotgun with slugs, or often a bolt action rifle with iron sights was deployed. Powerful big bore revolvers were also the norm in such situations. If we were in the woods at all, we were carrying such firearms, but we never saw AR’s in the woods, back then. However, these days, shooters have grown up with the AR platform rifles. Honestly, a lightweight AR, with about 8-10 rounds of firepower on tap, chambered in 500 AM, would be very effective against giant bears. How can a 400+gr., .50 cal. bullet going around 1,900 to 2,100 fps not be effective on 1,000+ Lb. bears? An added benefit to this cartridge is that it will chamber and fire in any revolver or single shot chambered for the 500 S&W. The reverse is not true, which means you cannot fire 500 S&W cartridges in a 500 AM chamber. In revolvers, please remember that the 500 AM headspaces on the case mouth, so it has no roll crimp and it can/will jump forward if subjected to the recoil of only a couple firings……this is not an issue in any single shot. 3. Item 500AM 440 HC-----Which is a hard cast (22 BHN) bullet (not lead) at around 1,900 fps. As soon as Greg starts to release production rifles, we will have quantities of these three loads available to the public. 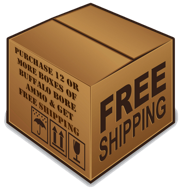 We will add a new load or two each month until we have covered all the bases for any type of ammo need. Stay tuned and thank you. Item 500AM 400 JFN is designed to be an all-around load for African or North American big game. Any critter the size of bull AK/Yukon moose (1500 or so lbs.) or smaller would be the kind of animal this load is made to dispatch. I would even use it on whitetail deer if that meant I did not have to re-sight my rifle with another load just for deer but remember this load will over-penetrate on animals of deer size and will kill whatever is behind your target animal if anything. In my singular test gun, velocities were right at 2,000 fps. Item 500AM 350 JHP is designed for critters under 600 lbs. and I’m sure it will kill much larger animals if you put that bullet in the right place. This bullet will likely disintegrate on big shoulder bones at close range, but as your range increases, impact velocity will decrease. So hit a critter beyond a couple hundred yards and this bullet will have slowed enough that it probably won’t disintegrate on big bones. In my singular test gun, velocities were averaging 2278 fps. Item 500AM 440 HC is designed for the biggest and most dangerous of North American or African animals, excluding elephant, which in my opinion has too thick and hard a skull to be shooting with even the best hard cast bullets. This bullet/load will work great on animals up to about 3,000 lbs., as it will not expand and will, therefore, penetrate deeply and straight. 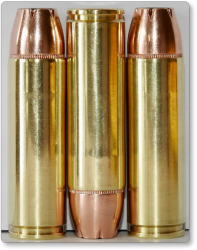 This bullet is the same bullet we use in two of our 500 S&W loads so we know it well. It is gas checked. It is also alloyed and lubed properly and will not cause lead fouling. The loaded cartridge looks weird because we are seating the bullet out of the casing past the crimp groove. We do this because the cartridge headspaces on the case mouth and if we seated the case mouth to the center of the crimp groove, it would be possible for that case mouth to get bent/dented into the crimp groove and cause head spacing issues—when we seat that case mouth onto a part of the bullet shank, the case mouth cannot be dented or squeezed into anything, thus assuring proper head spacing. Seating the bullet further out also allows us a bit more case capacity for two or three more grains of powder capacity. This is a very accurate hard cast load in my test rifle. In my singular test gun, velocities averaged 1,880 fps.